Today we’re thrilled to announce the next branch in Jira’s evolution: Jira Software. This new branch was created specifically for software teams, the customers who made Jira great from the beginning. Scientist and historian Stephen Jay Gould once said, “Evolution is a process of constant branching and expansion.” Though Gould was talking about human evolution, the same concepts of adaptation and progress apply to Jira’s evolution over the past decade. Today we’re thrilled to announce the next branch in Jira’s development: Jira Software. We created this new branch specifically for software teams – the customers who made Jira great from the beginning. Turns out, this evolution has been underway for some time. You may have noticed that Jira’s last four releases introduced a series of improvements that better integrate Jira with your software team’s developer tools. Most recently, in Jira 6.4, we launched Release Hub, which gives software teams the ability to check on the health and status of an upcoming release. In the short time since its launch, Release Hub has seen the highest adoption of any Jira feature we’ve ever launched. With the launch of Jira Software, Release Hub will be the first of many features that we can now design, build, and ship specifically for software teams. I know what you’re thinking: “Hasn’t Jira always been for software teams?” The short answer is yes. Jira’s roots are in bug and issue tracking, so software has always been in our DNA. But as Jira grew, it naturally evolved to meet the needs of software and non-software teams alike. And the more Jira grew into non-software teams, the more obvious it became that we needed customized experiences for different teams. Jira Software offers the same flexibility, extensibility, and deep developer tool integrations that Jira users have had for years. But now software teams can enjoy functionality for agile planning, tracking, releasing, and reporting delivered in one purpose-built experience. When we launched Jira Agile as an add-on in 2009, agile planning and development was still a growing movement. Fast forward six years and agile development has become standard operating procedure for all software teams that release early and often. The teams at Atlassian that built Jira Software are no exception. Informed by 13 years of customer interviews, industry best practices, and data from thousands of high performing teams of every shape and size around the world, we’ve designed Jira Software to complement and support the unique way your team does agile. You and your teams don’t treat agile software development methods as an add-on to your development practices. Now, neither does Jira. We combined the best parts of Jira and Jira Agile into one offering for software teams so that agile is not only the heart and soul of your team, but of your issue tracker as well. More than ever, Jira Software is the tool your software team needs to build and deliver amazing products, faster. 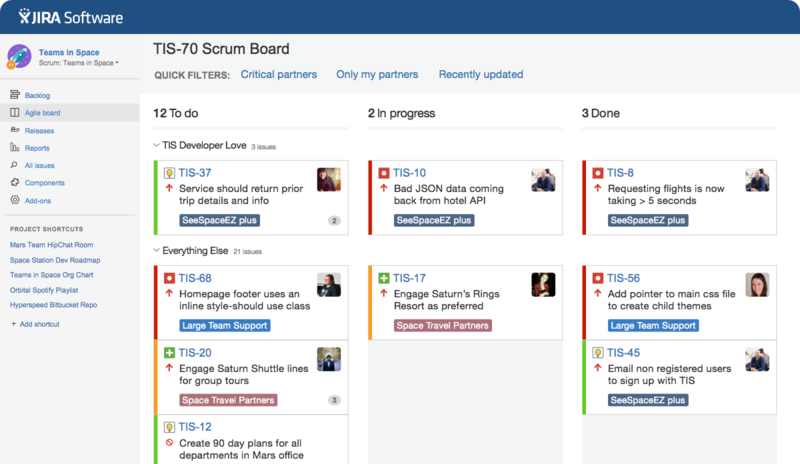 Plus, the Jira team has advantages over natural evolution: real-time feedback and iteration. As many of you noticed and commented on, we’ve been user testing a new sidebar experience that puts projects at the center of your work in Jira. Projects unite teams and rally everyone around a common goal, which is why we made the project sidebar a permanent addition to Jira Software. The closer each team member is to a project, the easier it is to align and collaborate to get the job done fast. Like any Jira feature, the new sidebar is customizable, allowing each team to include custom links that connect team members to valuable content. From Confluence pages, to Bitbucket repos, to Hipchat rooms, everything your team needs is a click away. One of the great things about evolution is that it’s a continuous process of change and improvement. For our team, Jira Software is the beginning of a new era. Jira now has an entire team focused solely on creating value as quickly as possible for our first and largest audience: you. We hope you’re as excited about this advance as we are. Millions use Jira Software to plan, track, and release world-class software. We can’t wait to see what you and your team are going to build with it! Want to learn more about Jira Software? Backed by 13 years of industry-leading tooling for software development and data from thousands of agile teams, Jira Software is raising the bar for great software development. Whether you’re new to Jira or have used it for years, check out our webinar on Jira Software hosted by Jake Brereton, Sr. Product Marketing Manager for Jira Software, and Jason Wong, Principal Product Manager for Jira Software.